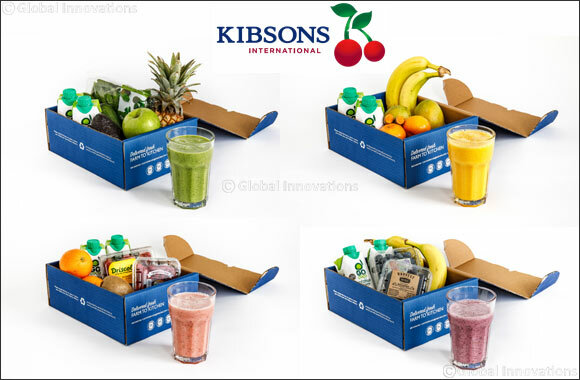 Dubai, UAE, July 03, 2018: Kibsons, the leading online home delivery service have just made getting your 5-a-day a whole lot easier with the introduction of their newly launched, great value ‘Smoothie Boxes’. Enjoy a breakfast of champions or a health filled mid-morning snack that couldn’t be easier to prepare or create. Kibsons have done the hard work so you don’t have to and grouped together a range of perfectly matched fruits and vegetables that work beautifully to give you a deliciously nutritious start to the day. Reaching for your convenient smoothie box each morning will fast become the norm and you can have fun trying out all of the appetising flavour variations in the process. Kickstart your day with the Berry Booster, loaded with blueberries and blackberries that are full of Vitamin C to leave you feeling super energetic and ready to face whatever the day brings you! Bananas offer an irrisistable creaminess and contribute to your daily fibre intake and coconut water, a delicious source of hydration. This nutritional powerhouse is packed full of apples, spinach, avocados, cucumber, pineapple and coconut water. Start your day in style and be sure you are well on the way to your 5-a-day. This smoothie certainly packs a punch and is naturally low in sugar, with the pineapple providing all the sweetness you need. The Rainbow Revitaliser brings a colourful and nutritious pot of gold to your morning! With deliciously fresh raspberries and strawberries packed with vitamins and goodness, low-calorie kiwis, fibre-strong oranges and fat-free coconut water this smoothie will put a spring in your step for the day ahead. Pure sunshine in a glass, the Sunshine Sipper is brimming with flavour and fun! Transport yourself to a palm tree filled beach with this delicious smoothie that includes Vitamin C rich mangoes and mandarins. Hydrating coconut water brings the wake-up factor and the added banana will keep you full for longer, waving off any mid-morning cravings. Lastly, a touch of turmeric provides a dazzling glow and a number of other health benefits. All of the Kibsons smoothie ingredients can be easily blended with a squeeze of honey and enjoyed over some ice, if you prefer. Prepared quickly and conveniently as you start your day, these super-healthy smoothies can be enjoyed by the children for breakfast, in the car en route to work or as a mid-morning pick-me-up at your desk. Getting your 5-a-day just got a whole lot easier! Kibsons offer convenient, healthy and affordable products that range from fresh fruit, vegetables, organic ranges, meat, seafood, dairy, bread, nuts, drinks, spices, oils and snacks, in addition to their newly launched smoothie boxes. All of their fresh produce is handpicked with free delivery directly to your door. Their wholesale prices are unbeaten and offer great value for money as well as total convenience. With their fantastic range of fresh fruit, vegetables and meat being 100% natural and healthy with no hormones, additives or artificial preservatives, you can rest assured you are feeding yourself and your family the very best.